They were late, but that’s not unusual when you’re paddling 23 miles instead of the planned 11 miles for the day. Sleek red, blue and yellow kayaks streamed into view carrying a dozen worn but happy faces. Ten Brevard College students and two Brevard College professors wound their way from Lake Lure, N.C., into Berkeley County’s blueways last week. 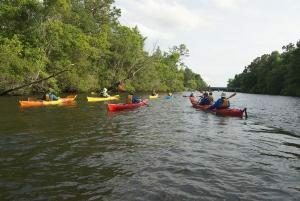 On Wednesday, May 18, the troop had a lot of miles to paddle before sundown to make up for the miles lost the day before on Lake Marion. They paddled 23 miles by the time they pulled up at the boat dock at Durham Creek and Cypress Gardens Road. Their total mileage was at about 280 and they still had two more days of paddling before their trip was complete at Sullivans Island. Voice of the Rivers began in 1997. Every year, the program picks a different river system to navigate with about a dozen college students, picked from mountains of applications. This year’s trip is the third time the college has sent a team to travel through Berkeley County. One year, the kayakers traveled through Patagonia. Wilderness Leadership and Experiential Education professor Clyde Carter has led expeditions since 1999. Each day, a new student leader is assigned. The leader has to make tactical decisions as the weather changes or the team encounters problems. Most of the folks who sign up for the expedition are in the WLEE (referred to as “Willy”) major, but Carter said the program pulls from a diverse array of majors. This year’s team had a botany major, an English major and a math major. “We purposefully get a mix of disciplines,” Carter said. The program also includes a non-WLEE professor. This year, English associate professor John Padgett donned his life vest and took up the paddle. He geared his English literature class toward the program, titling it “Carolina Creations,” and explored authors who wrote about Carolina rivers. Padgett is from Hampton County originally. He said he heard this year’s Voice of the Rivers would travel to his native Lowcountry and told his wife. “She basically made me. She said, ‘You have to apply for this,’” Padgett recalled. Padgett, naturally, has a poetic look on Carter and him traveling this river. Padgett grew up in the Lowcountry, and Carter grew up near Lake Lure where the trip began. “We’re bookends on this river,” Padgett said. What has struck the English lit professor the most has been the daily progression toward the sea he said. Carter said the trip is planned to log in a number of miles each day. Before setting out, potential hosts are called and permission is gained for camping along the way. The program focuses on connections to the river so, on this trip, students stopped and talked with people involved with the hydroelectric dam, a family that has historic ties to the river, and everyone in between. “We’re connected to the river in many different ways. As these students found out, we are all connected to the river,” Carter said. That family with historic ties is the Lutz family on Lake Marion. The students waxed fondly on that overnight stay that featured a real, honest-to-goodness home-cooked meal. Of course, more than two weeks on a river expedition makes you wax fondly about anything food related. When the students arrived at Durham Creek landing, the student in charge of transportation had a treat waiting: boxes of Krispy Kreme donuts. On Wednesday, rising senior Davis Jones was the student leader in charge. So, has the program met his high expectations? “It’s everything and more,” Jones said. Kelly Turbeville and Elizabeth Kitchens are both South Carolina residents who joined the troop this year. Turbeville grew up in Columbia and wanted to paddle through the Broad River. Turbeville said the moment that has stuck out to her the most was meeting the Lutz family and seeing their connection to Lake Marion. “I have a bond with a certain place like that also,” she said. Kitchens grew up in Charleston and wanted the experience of paddling home after semester. She said when she first saw Spanish moss clinging to trees, she felt excitement.